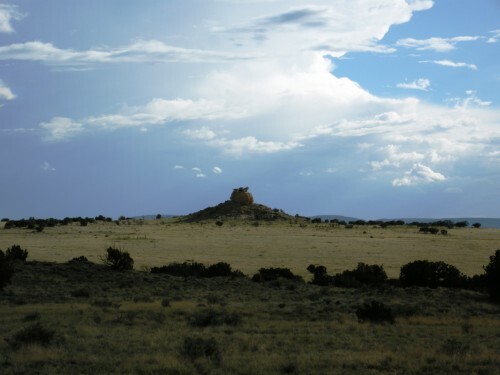 Poking around the Ranch /Hawks Aloft Inc. Heading northwest out of Grants, New Mexico, on its long and lonely journey across dusty plains and tablelands, Highway 509 runs parallel to endless lines of coal trains moving their valuable loads to market. The coal, strip-mined from seams running just below an overburden of newer rock, is a reminder that the world is viewed through human eyes as a snapshot; our sense of time constrained by the rapidity of our own journey and the imperceptible pace of geologic change. Still, the coal speaks volumes. Once, this land was teeming with life, generation after generation laying down its bulk on the floor of an ancient sea. Now, as the dragline digs deep into the sedimentary exuberance of its carbon-rich past, the land’s surface, at 7,000 ft, is dry and sparsely vegetated. Life still persists here, but only as a miracle. This spring and summer, for the eighth consecutive year, Hawks Aloft, Inc. was contracted by Peabody Energy to conduct breeding season raptor monitoring on the company’s Lee Ranch El Segundo Mine project area in McKinley County, New Mexico. Over the past eight years, Hawks Aloft biologists have traveled hundreds of miles on the two-track ranch roads surrounding the mine, checking every cliff-face, power line, and juniper for the new whitewash or stick nests that might suggest the presence of a breeding raptor. Though Golden Eagles, Ferruginous Hawks, Prairie Falcons, Red-tailed Hawks, and Great Horned Owls are all fair game, it’s the American Kestrels and the Common Ravens (a non-raptor species included in the study because of the stick nests it build that are utilized by many raptors in subsequent years) that seem to flourish beyond reason, across this drought-stricken land. Year after year, as the populations of other raptor species blink on and off at the margins of survival, the kestrels and ravens find a way to replenish themselves. 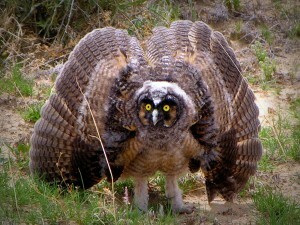 A Great Horned Owl attempting to intimidate the photographer at the El Segundo mine. Photo by Mike Fugagli. For the American Kestrel, the secret is the species’ diminutive size and its ability to live on an insect prey-base. 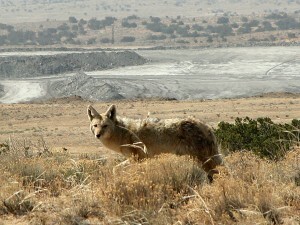 Larger raptors that specialize on a diet of small mammals are more prone to the boom and bust cycles of rodents, rabbits, prairie dogs and their ilk. For the Common Ravens, black as the coal hiding beneath their rock-strewn homes, success comes from the application of a wily intelligence and a generalist diet. Too often portrayed as a symbol of death, the raven is, in fact, the opposite: a species ordained by the logic of natural selection to carry life’s banner into the nooks and crannies of an otherwise desolate land. The spring and early summer of 2014 remained a tough time for breeding raptors in northwest New Mexico. A persistent drought continued to plague the region leaving the kestrels and ravens with very few additional species with which to share the skies. One pair of Golden Eagles was consistently found on territory from March through May. Finding their remote nest was a highlight of my season, but the nest was quickly abandoned during incubation and the birds subsequently began to wander farther afield. Of the four active Ferruginous Hawk pairs documented in 2013, only one returned to breed in 2014, successfully raising only one chick. No Prairie Falcons were documented in 2014, no Burrowing Owls were found and, although Red-tailed Hawks were occasionally seen during surveys, no active nests were discovered. By the end of May, all hope of finding even a single pair of nesting Great Horned Owls was gone, with every spot where the species had nested in previous years abandoned or occupied now by the ubiquitous ravens. Cue the unexpected, the great joy of field biology! With many fewer nests to monitor in 2014, there was more time to poke around. Poking around, of course, is both art and science. Do I have enough water? Do I have enough time? Sometimes it’s a rare clump of oaks that draws me closer, or a particularly dense stand of junipers. Sometimes it is a recess in a cliff wall that offers hidden respite from the sun at lunchtime that turns out to have just the right micro-climate for an owl to survive. 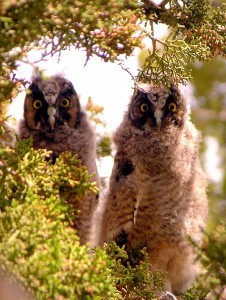 Long-eared Owls had been documented once before in the project area, nesting unsuccessfully in a small group of junipers near Little Orphan Annie, the charismatic rock the juts up out of the surrounding plain and gives the USGS quadrangle it occupies its name. This year, the Long-eared Owls were successful, nesting in a cliff-cavity about a half-mile north of their previous location. They were stumbled upon by accident when the male was flushed from a day-roost littered with pellets, the happy result of poking around in an unusual spot. The opportunity to follow this nest while watching the bird’s moth-like flight, photographing the adults and their three plus juveniles, and listening to the species’ strange vocalizations was the true highlight of the season. Eventually, a fledgling Great Horned Owl also was stumbled upon during a random walk through a copse of trees. Although its nest was never found, the bird was hiding in plain sight and couldn’t wait to have its picture taken. Its mother, a huge, greyish bird whose plumage melted into the nearby rocks, was more intent on keeping her secrets. Unseen until flushed, she disappeared in broad daylight leaving behind no trace other than the strange feeling that you had just encountered a ghost. By the end of June, most raptors have finished up their breeding season. Only the kestrels, the late ones, still have nestlings peeking out of their previously undetected caves. The rest are out discovering the joys of flight, their begging calls audibly connecting the various family groups. In the grasslands and shrublands, stretched between the loftier haunts of raptors, songbirds also are moving in family groups. Some species, like the Horned Lark, are coalescing by the hundreds, building the outsized flocks that will later place their lilting voices on a ceaseless winter wind. But most passerines, like the inscrutable Bendire’s Thrasher, travel only with their own fledglings. Unlike the Rock Wrens, Mountain Bluebirds, and Loggerhead Shrikes that seem to pop up everywhere, the Bendire’s Thrashers are all but invisible, their shyness no doubt explaining part of their rarity. In July, when the monsoon rains finally came, the field season had already ended. Sometimes, a field biologist is destined to know a place for only a season. Although there are now reports of fresh, green grass and standing water, the rumors lie in wait like buried coal, unconfirmed proof of a once verdant world.